Tom Aiken's ex head chef has opened his own place at The Blackbird Bagnor – expect the unexpected. Newly refurbished and much raved about The Blackbird in Bagnor, near Newbury, has been getting a lot of attention from food critics. Why all the buzz? 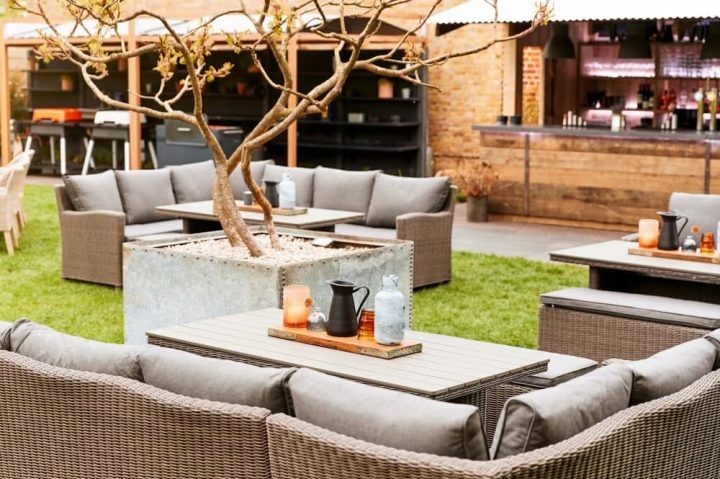 It might have something to do with Chef-owner Dom Robinson’s fine CV – having worked with renowned chefs Tom Aiken, Adam Byatt and Anthony Demetre. First impressions? 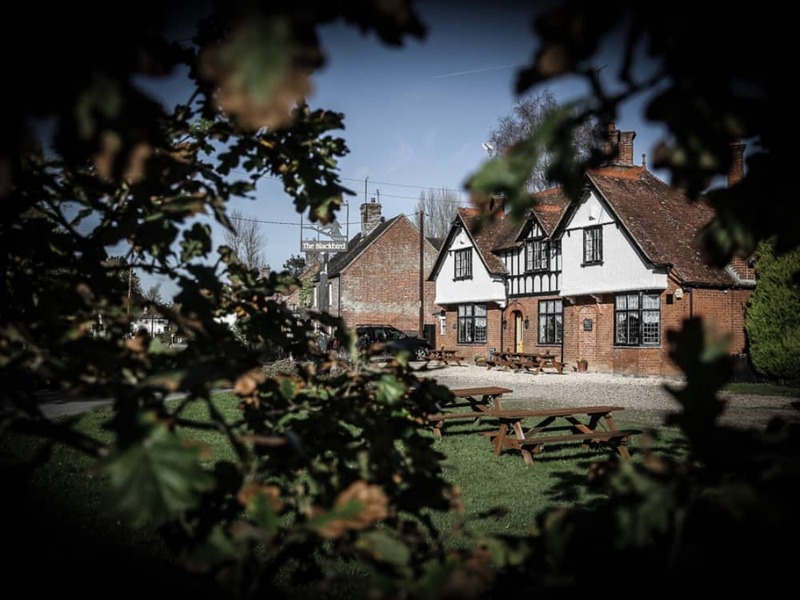 The Blackbird is a classic country pub with grassy beer garden, roaring fires and low beams inside – all present and correct. But… oh my goodness, the food! Believe me, we are not talking your average triple cooked chip, gastropub fayre here. 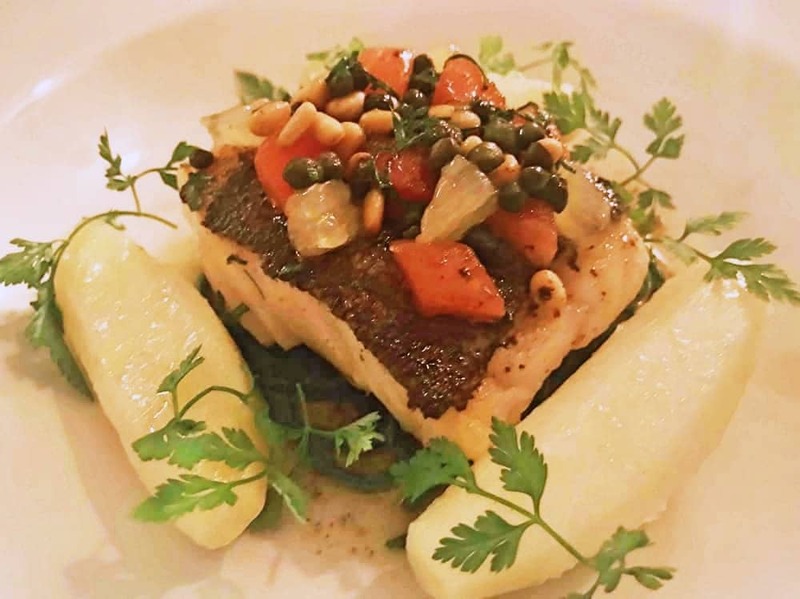 It’s a renaissance of classic cuisine using local, seasonal ingredients. Spoiler alert! It”s a bit spesh. 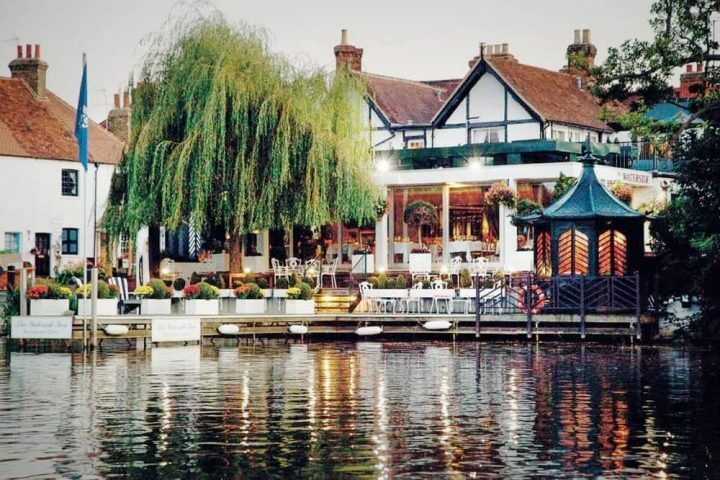 It has been Dom’s lifelong dream to open his own restaurant and having spotted the pub for sale while living in Dubai, he hopped onto Google Earth for a nose and Google guided him through the weeping willows to The Blackbird. It was love at first sight – I have to say, it’s very pretty in these parts. A cluster of period cottages, rippling river, swans, ducks, plus the high-acclaimed Watermill Theatre is a short stroll down the lane. 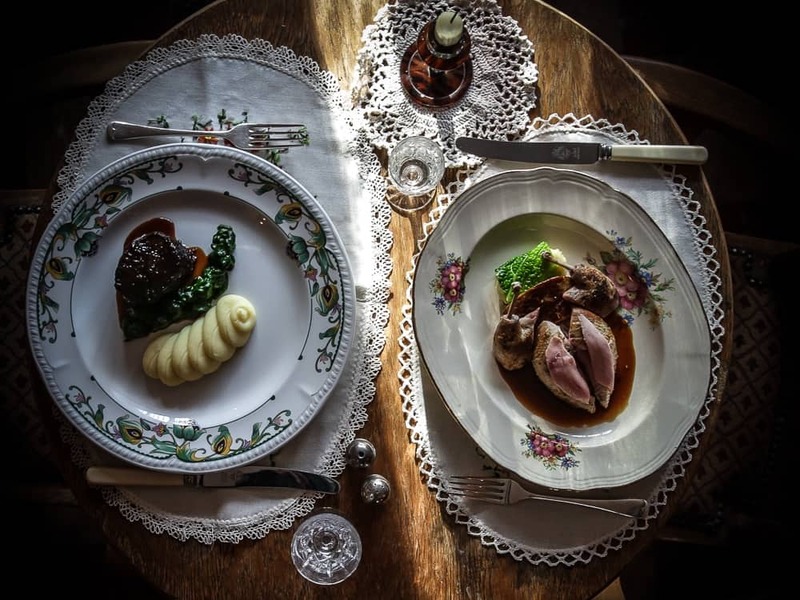 The aim of The Blackbird is to offer impeccable restaurant food in a relaxed, homely (if slightly eccentric) setting and still be a pub that’s at the heart of the community. 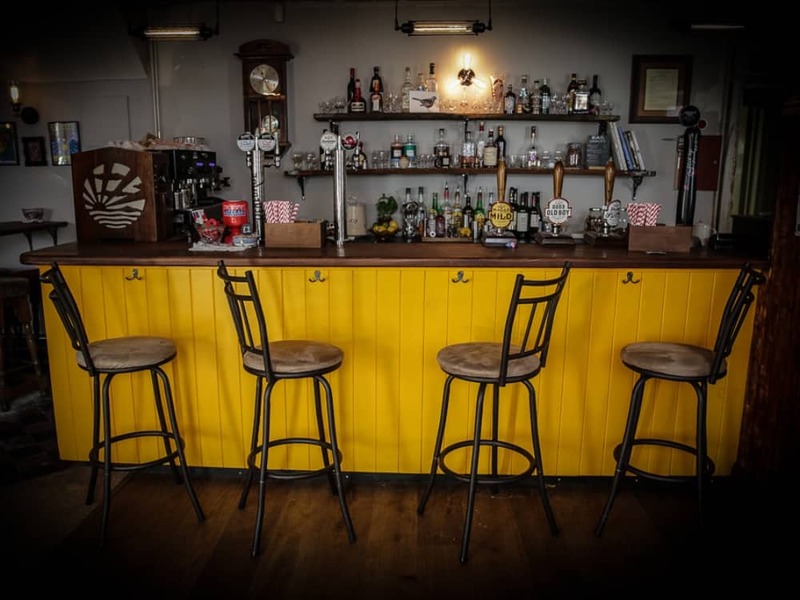 At first glance you think typical rural watering hole with tactile wooden furniture and charming prints on the wall, look a little closer and you may be mistaken for thinking you’ve taken a detour into your gin-soaked grandma’s living room. 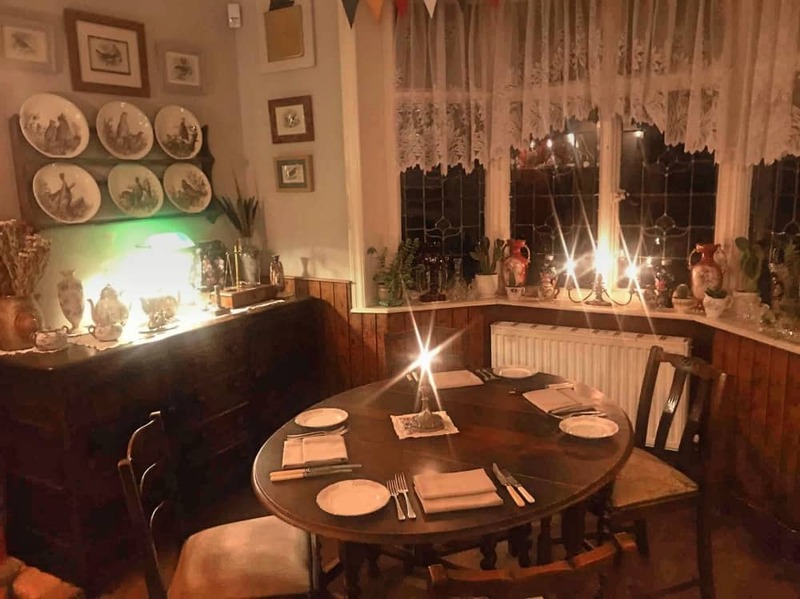 Batty nana chic is very much the vibe – heirloom furniture, crystal cut glass, chintzy tea sets and the food is served on beautiful mismatched vintage plates, embroidered placemats and the bone-handled cutlery reminded me of my own granddad. He wouldn’t eat his food with anything else. Mr Muddy was a little thrown by the decor, but I was sold as soon as I saw the bright yellow bar, net curtains and contemporary art. There is an authenticity about The Blackbird. The interiors are very much the style Dom and his wife Marliz love. The food is not chasing trends, it’s true to Dom’s immense skill in the kitchen. 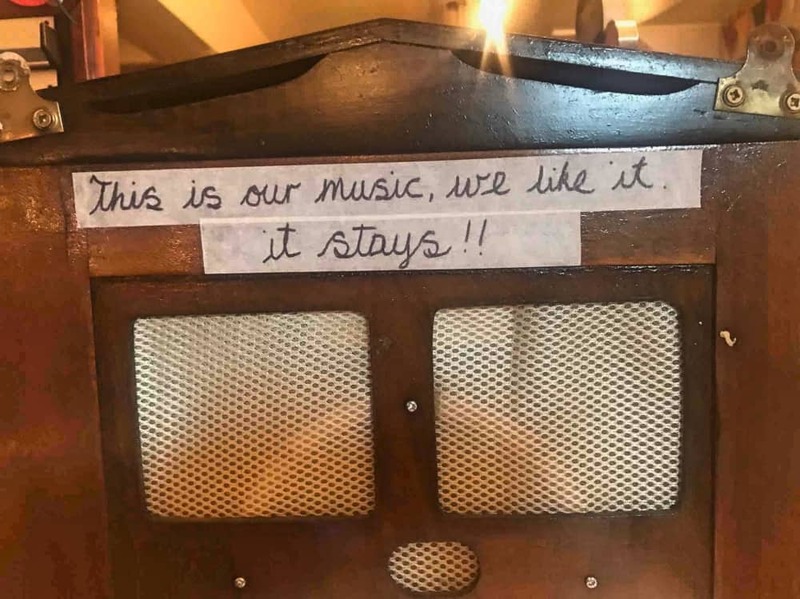 And the music, gently pumping out of a 1930s speaker, is a delicious selection of 80s tunes which can be Marmite for some, but anywhere that plays Cyndi Lauper and Tina Turner in the same night will be a friend for life. But read the sign, this is what they love, and it’s staying. I’ll drink to that. There was a good crowd in for a midweek evening we visited (not always the case with rural pubs), couples on dates and a gang of friends. Whether you’re popping in for a drink, flying through pre-theatre or feeding the family after a leisurely dog walk, everyone is welcome – really welcome, in fact. The service was exceptional, friendly and patient in the face of my gazillion questions about the menu. 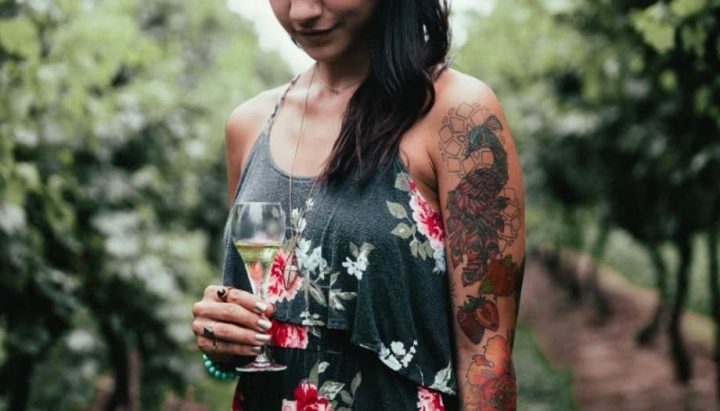 I’ll start, as we did, with the wine – a highly curated selection that Dom describes as a work in progress, but emphasis is on quality for every budget. I tried a crisp French Chablis and a rather predictable Sauvignon Blanc (need to break that habit, but maybe just one more) while Mr M enjoyed West Berkshire Brewery’s Renegade Indian Session Ale, and all were wonderful. The food is locally sourced (where possible). Dom bakes fresh wheaten bread every day (made with black treacle and buttermilk), slather a slice in butter and I died and went to carb heaven. 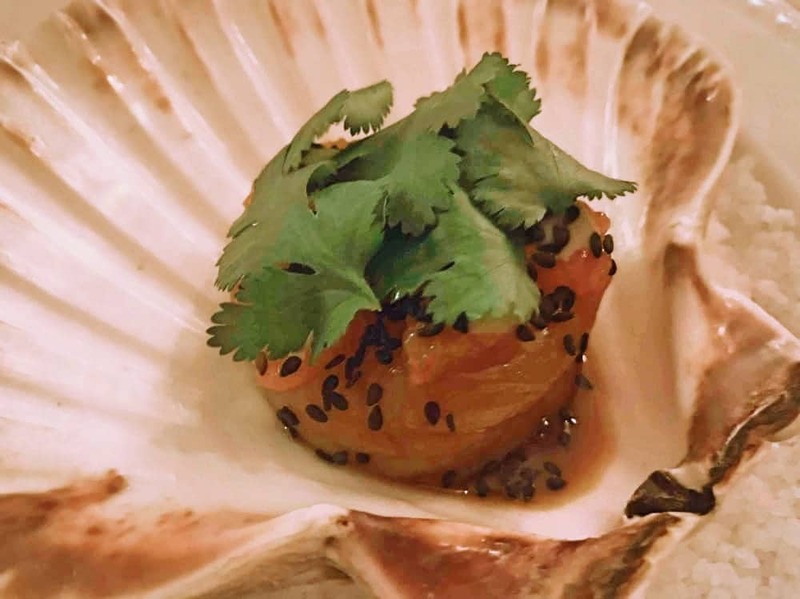 I started with an Asian inspired marinated scallops, pink grapefruit, sesame and coriander served with a puffy cracker. It’s a cold dish which was unexpected, but a happy surprise. Mr Muddy opted for Kennet crayfish and asparagus salad which was fresh, light and gone in just a few minutes..
For mains, we had Cornish cod a la Grenobloise, samphire and new potatoes and slow cooked shin of beef and raclette garnishes. Both were exceptional. We added a side – there is no end to gluttony – a simple but delicious heritage tomato salad, which was a plate of sunshine. After all that food, I thought pud was going to be a challenge but we bravely ploughed on (the things we do for you). 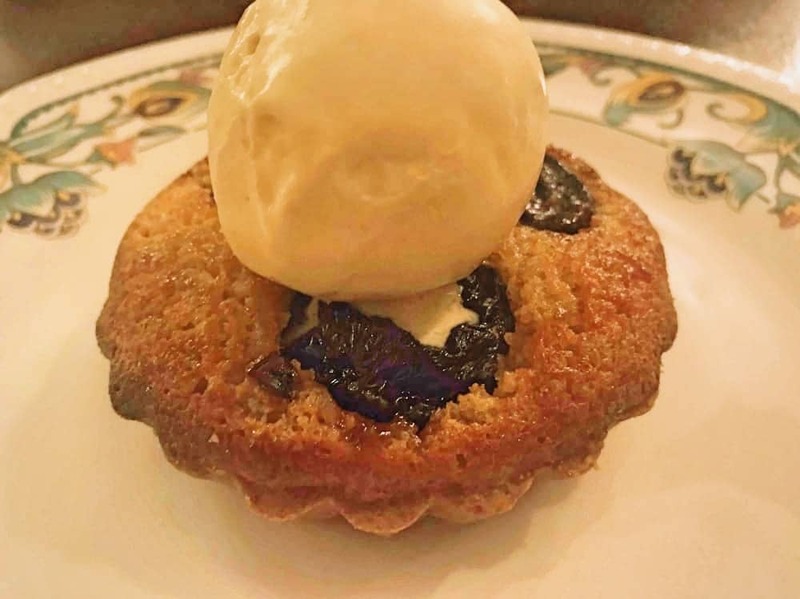 My prune and almond tart was light and the Armagnac ice cream was rich and boozy (just the way we like it), while Mr M’s Rooibos creme brûlée with mandarin sorbet was demolished in seconds. Quick Google of Rooibos and we discover it’s a tea – now we all know. More? It sounds like a lot of food but the dishes were perfectly proportioned. I could manage 3 courses without feeling overly full, yet my husband’s (much bigger) appetite was more than satisfied. We’d managed to escape sans enfants for the evening (yippee) but I’d definitely return on a weekend lunchtime with the gang to try out the kids menu (croque monsieur, mini roast, fish and pasta with ragu) and the lovely garden with wooden climbing frame – yes, frazzled parents you will get five minutes’ peace on a sunny afternoon. Get down here, pronto. 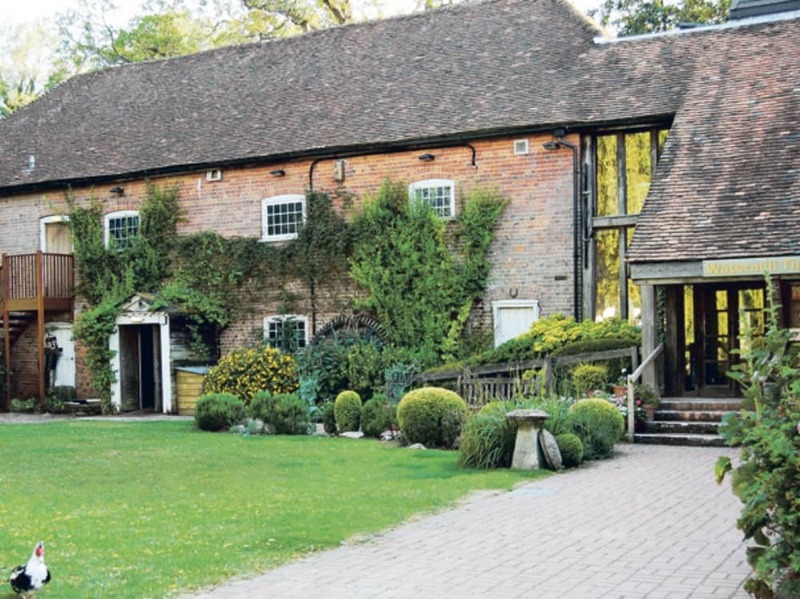 Culture vultures have lucked out here, the superb Watermill Theatre is literally a few minutes walk away, and there’s a pre-theatre menu. My advice, arrive a little before 6pm, study the menu and then order asap, then you’ll have time to tuck into 3 leisurely courses, a couple of glasses and make it in time for curtain up. Newbury town centre is a 5-10 minute drive away if you fancy a mooch around the shops and for a proper stroll, trudge around Donnington Castle. Good for: Everyone – sometimes restaurants with outstanding food are best for formal, adult occasions but The Blackbird totally works if you’ve got the kids and/or the dog in tow too, and whether you’re in muddy wellies or muddy stilettos. And this place was built for all seasons – you can cosy up indoors or while away sunny days/evenings in the garden. Nor for: This probably isn’t the spot for a wild and boozy night out with a big group of mates – it’s not really a cocktails-and-chasers kind of bar. And if you’re not a fan of dogs, you might not find it an entirely relaxing experience. The damage: It’s a little more than your average gastropub, but reasonable for food of this quality. Starters are from £9. The Kennet crayfish is £16 , mains £18-£26 (the cod and beef dishes we had are both £25) and desserts are around £8. The Blackbird, Bagnor, Newbury RG20 8AQ; 01635 40005.